This post is one of a series, highlighting old new features (these are additions to the software that have been made in the last few months, but were never described on the blog). For more information, view the original post. In the past, one of the most time consuming tasks for reservation staff of rafting and adventure companies has been collecting and entering guest information, either into reports or into their reservation system. This is especially true for overnight trips, where a substantial amount of information is required. Often, the process would require printing forms, postage, waiting for a response and then deciphering the guest’s handwriting to type the information into the reservation system. 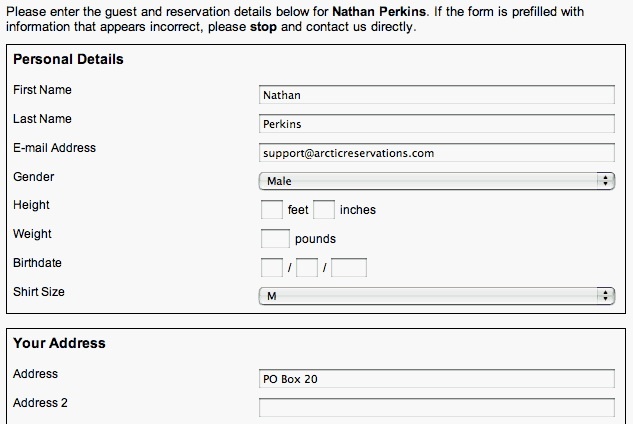 A new module for Arctic Reservations, called Complete Reservation, helps cut down on waiting time to collect such vital guest information and, more importantly, saves your reservation staff time in terms of having to enter that information. Once a guest has booked a reservation, the staff simply sends them an e-mail containing all the trip details and the invoice. The e-mail will include a personalized invitation URL, that will allow the guest to visit the company’s website and fill in all their guest information. All this works through the My Module functionality of Arctic Reservations, which allows you to integrate Arctic with your company website. Through an extensively customizable template system, the website will match the design of the rest of your site. In addition to booking new reservations and sharing photos, this website can be used by guests to access trip details, download invoices and liability agreements and enter all needed personal/group details. Details entered automatically appear in the appropriate customer record, and a notification appears on the home page log, allowing you to review the details and ensure that all information is correct. The information collected can range from basic details (contact information), to extensive food preferences and emergency contact information. And the module can be configured to collect different information for different trips. Of course, due to the variety of group types (families, couples, groups of friends), the module seeks to accommodate all configurations. For families, most details entered are common to all guests (such as contact information). While, for a group of friends, each person can fill in their own details. And the primary contact can view who still needs to enter their information, and even send them a personalized link to the website as well. This new module will help increase efficiency and help ensure all guest details are accurately collected, while freeing up office staff to pursue new reservations, instead of spending time collecting data. If you are interested in trying this new module or adding it to your installation, contact a sales representative. As it is now entering peak season time for many rafting companies, it is exciting to announce that this is the third season that Arctic Reservations has helped different rafting and adventure companies manage their reservations, trips, customers and billing. And although the blog has been quiet recently, the software has been anything been static. There have been new features and new reports introduced, as well as new modules developed and many improvements to the interface for the software. But the blog has been neglected, so over the coming few weeks, I will aim to write posts highlighting many of these (already older) new features. If you haven’t tried out Arctic Reservations, let me encourage you to take a look through our demonstration version.